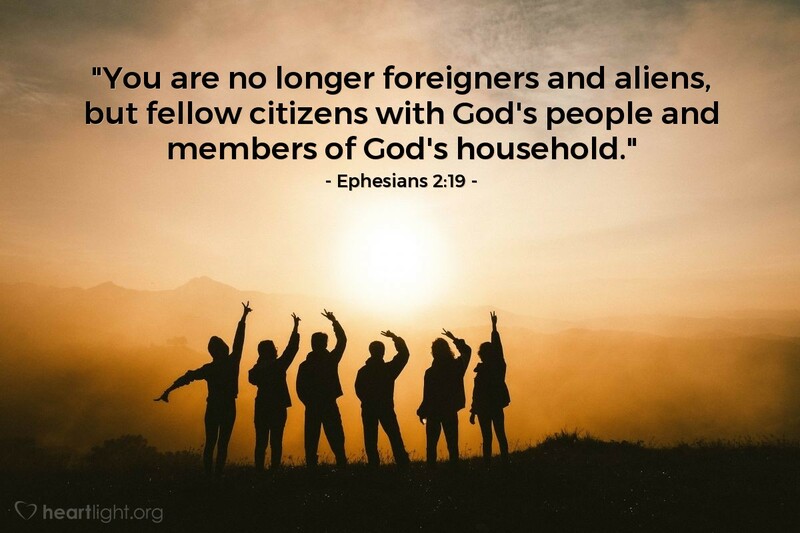 "You are no longer foreigners and aliens, but fellow citizens with God's people and members of God's household." Those of us who have been Christians a long time sometimes forget that we have no claim or right to the grace we have received. When we feel we deserve it, that it is ours by right, it is no longer grace and we no longer live in it. To be a part of God's family is grace. For the Holy One who spoke into existence the universe (in which we are a submicroscopic speck), grace is simply and magnificently a gift from the One who knows how to share and love in ways we can't even imagine. For the incredible and boundless love you have given to me, O Almighty God, I can only fall to my knees and thank you. Your power is beyond my comprehension. Your awesome holiness is beyond my understanding. Yet your infinite grace is mine because of your love which cost you so much. Thank you. A million times over I say it, "Thank you!" In the name of Jesus my Lord. Amen.